Restricting sulfur hexafluoride (SF6) emissions: SF6 is a potent greenhouse gas (23,900 times more powerful than carbon dioxide) used for insulation in electrical transformers. Massachusetts’ new regulations would reduce the allowable leakage rate of this gas from current standards of 3.5 percent per year to 1.0 percent by 2020, as well as establishing a mass-based cap on total emissions of SF6 starting in 2018. These standards would apply only to the two federally-mandated reporters of SF6 emissions in the state (Eversource and National Grid). Reducing leakage from natural gas distribution systems: In addition to being used as a carbon-emitting fuel in power plants and heating systems for homes and businesses, natural gas itself is a greenhouse gas (25 times more powerful than carbon dioxide). Massachusetts’ new regulations establish mass-based, declining caps for leakage of natural gas from distribution systems for each of the local natural gas distribution companies (LDCs) in the Commonwealth. These caps are determined based on the mileage of pipe owned by each LDC. In aggregate, these new rules will reduce natural gas emission levels by about 10 percent in between the years 2018 and 2020. Establishing a Clean Energy Standard (CES): Beginning in 2018, Massachusetts utilities will be required to procure a percentage of their energy from qualified clean energy sources (see Figure 1, below). 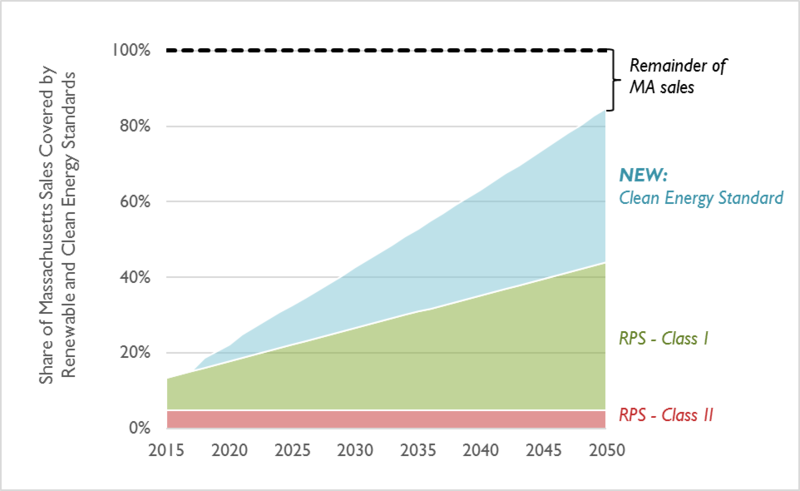 This new set of resources is essentially layered on top of the already-existing renewable portfolio standard (RPS) program. Resources can qualify as “clean” if they feature emission rates at least 50 percent below the level of new natural gas-fired combined cycle units. In effect, this includes wind, solar, hydroelectric (including large hydro), nuclear, and certain types of biomass generators. It would also include fossil-fired generators equipped with carbon capture and sequestration (CCS) technology, although no such units are currently operational, under construction, or proposed in New England. Resources can qualify if they are located in New England, or if they have exclusive contracts to supply power to New England utilities (such as the type specified for Canadian hydroelectric imports in Massachusetts’ summer 2016 energy legislation). Importantly, resources can only qualify if they began commercial operations after 2010, which means that few existing hydroelectric facilities and none of New England’s nuclear generators qualify. Resources outside of New England must also demonstrate that they are delivering electricity through transmission capacity that came online after 2017. All resources that qualify under Massachusetts’ Class I RPS program automatically qualify under the new CES. This standard requires all utilities (including both investor-owned and municipal utilities) to meet 20 percent of sales through CES-qualified resources in 2020, and escalates to a requirement of 80 percent of sales by 2050. Capping emissions from in-state electric generators: Massachusetts is already part of the Regional Greenhouse Gas Initiative, a carbon reduction program which effectively allocates 11.3 million metric tons of carbon dioxide emissions to Massachusetts electric generators in 2020. New rules from MA DEP will set more stringent caps for in-state sources only: 8.66 million metric tons in 2020, declining by 2.5 percent each year to 2.17 million metric tons in 2050. There are two separate emission cap categories: one for existing generators and one for new generators. These caps are intended to maximize “direct environmental benefits” for Massachusetts citizens—highlighting the co-benefits that are expected to arise from programs designed to reduce greenhouse gas emissions. Setting limits for emissions from the transportation sector at certain state agencies: New MA DEP rules will require emissions from Massachusetts Department of Transportation vehicles to decrease by 3 percent by the year 2020. MA DEP also requires that agencies within the Massachusetts Executive Branch reduce emissions from passenger vehicles by 2 percent by 2020 and 19 percent by 2025. Setting emission guidelines for the entirety of Massachusetts’ transportation sector: MA DEP also promulgated non-binding guidelines suggesting the entire sector reduce emissions by 4 percent by 2020. These suggestions echo the state’s public commitment to reaching an electric vehicle penetration of approximately 300,000 vehicles by 2025. While these are historic regulations, much remains to be done: First, program design and oversight will be required to ensure these regulations are enacted and complied with over time. Second, rigorous modeling will need to be performed to validate the Governor’s expectations of reductions in emissions that will result from the targets, along with their economic impacts. Moreover, even though this proposal constitutes one of the most ambitious programs of emissions reductions yet proposed in the United States, these regulations only scratch the surface of the emission reductions possible from the transportation, buildings, and industrial sectors. Finally, regulations like these need to be enacted in other states to ensure the United States does all it can to avoid catastrophic climate change. MA DEP is taking public comment on these new rules beginning in February 2017, with the rules expected to come into full force beginning in 2018. Figure 1. Share of Massachusetts sales required to be met through either the existing renewable portfolio standard or the new Clean Energy Standard. By 2050, only 15 percent of Massachusetts sales will not be required to meet a low emissions standard.